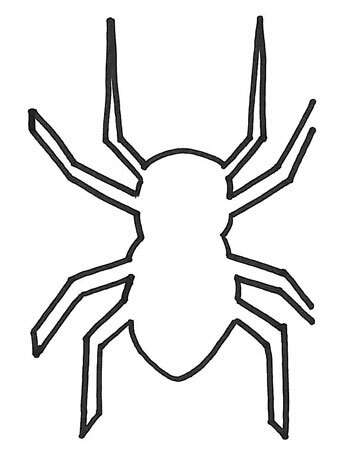 Spider and cobweb stencils for cakes, spooky paper bats, and more fun and easy Halloween craft templates. Follow the Footprints Cake Template Place this template on the sheet cake and dust with cocoa powder. Pendleton Blankets Template Use this template and washi tape to get the look. Woody Wagoneer Template Trace the Wagoneer template on plaid fabric, scaling up or down as necessary, and cut out; attach to a pumpkin with small map tacks. Wood-Burning Stove Template Trace the door template on the pumpkin, scaling up or down as necessary, and use a knife to cut out the window-panes. Dartboard Template Scale the dartboard up or down as necessary, and use template to cut 10 triangles from white contact paper and 10 triangles from black contact paper. Jigsaw Puzzle Template Trace the puzzle template on the pumpkin, scaling up or down as necessary. Pickup Truck Template Turn an oblong pumpkin on its side then trace this pickup truck template—download and adjust size as needed. Hen and Chicks Template Trace this hen and chick template on a big pumpkin and tiny pumpkin. Sunflowers Trace this template onto pumpkins and use a knife to cut out the petals and leaves. Barn Quilts Template Cut out a design from our template to create a stencil of desired quilt pattern. Spider Template Scare up a pair of scissors and a ream of craft paper and get snipping using a variety of traceable templates. Spooky Menu #1 Template Make a spooky cutout menu with this template. Spooky Menu #2 Template More spooky cutout fun. Cat Face Template Make a cute cat face garland for your mantel with this feline template. Carved Mason Jar Template This pumpkin ode to the iconic Ball Mason jar features “fireflies” courtesy of string lights. Boot and Moon Stencil We’re over the moon for these dotted odes to country icons. Spider Template Resize as needed. Trace around the outside of the silhouette and cut along the drawn line. 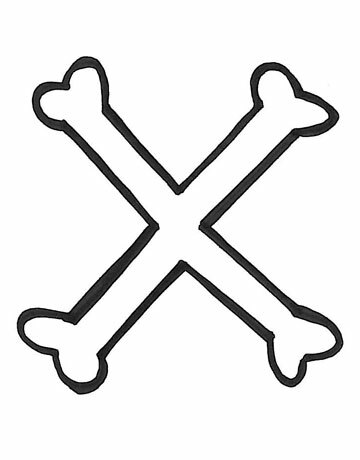 Bones Template Use this spooky crossed bones stencil for your Halloween decor. Skull & Crossbones Make eerie skull paper cutouts with this template. Haunted Houses Carve pumpkins with these little houses and make a whole pumpkin city! Skeleton Hand and Arm Create creepy skeleton arm pumpkins with these templates. Flames Make fun fireplace pumpkins with this flame template. Gravestone Lollipops Make these clever covers for candy suckers. Along Came a Spider Cake Stencil This spider cake is amazingly easy to make! Itsy Bitsy Spiderwebs Super-easy white-chocolate toppers appear to float, Houdini-like, over chocolate cupcakes. Night Lights Lanterns New York City stylist Marissa Corwin put a cheeky spin on the very word jack-o’-lantern with her three glowing silhouettes of old-school lamps. “They’re a bit more sophisticated than your average spooky face—something adults can appreciate, too,” she says. Shoot for the Moon Paul Lowe, a New York City stylist, found inspiration in a classic toy for his celestial creation: “I wanted to mimic the look of a Lite-Brite, so I punched holes to create a simple crescent moon—shaped image, then added a string of tiny bulbs to make it glow,” he says. Bat Stencils Craft these creepy bats involves little more than using a pair of scissors. Raven Stencils Set the mood for mischief with these spirited crafts. Crow Foot Template Stop dinner guests dead in their tracks with a custom-stamped tablecloth. Bird and Feather Templates A bell jar gives a no-carve pumpkin, with bird and feather designs, the star treatment. Bird Templates Serve up a daring display with stenciled bird plates. Mama Bird, Baby Bird, and Bird Nest Templates Go out on a limb with darling nesting pumpkins. Crow Template Orange paper lanterns take an ominous turn with help from tissue paper crows. This entry was posted in Carving, Pumpkin and tagged Pumpkin Carving, Templates.